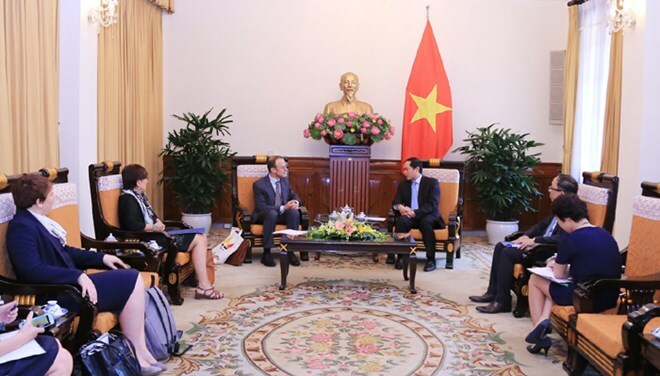 Hanoi (VNA) – Deputy Foreign Minister Bui Thanh Son welcomed Rudolf Huygelen, Director of the Belgian Minister of Foreign Affairs’ cabinet in Hanoi on April 4. Lauding Vietnam’s achievements in socio-economic development, the Belgian official pledged to continue supporting Vietnam even after the end of the two countries’ cooperation programme. Deputy Foreign Minister Son said the Dinh Vu – Deep C industrial park in Hai Phong, a Belgian-funded project in Vietnam, is marking 20 years of operation. He asked Belgium to replicate the successful model as part of the European country’s commitment to a long-term partnership with Vietnam. Son noted Vietnam appreciates support from the Belgian Government’s development programme and welcomes the Belgian Embassy to hold the Innovation Days event at the end of 2017 in celebration of 40 years of cooperation with Vietnam. Reviewing bilateral cooperation, both host and guest agreed to improve local business climates and facilitate access to their respective markets. They also agreed to work together to organise cultural and economic events to mark the upcoming 45th anniversary of diplomatic relations between Vietnam and Belgium.